Chilly…….Great Fishing…..I See A Pattern Here…. Tues. Oct 20, 2015……. Had some great days so far this month, and I must say the cooler weather has done wonders for the fishing, at least our trout waters….smallies ….? Not so much. In fact, smallie fishing is winding down and soon we’ll be doing mainly trout and the occasional musky trip. Winter largemouths too on local waters……Just ripe with opportunity if you live in our area. Had some great trips the past few weeks, and this week has started off with a bang. 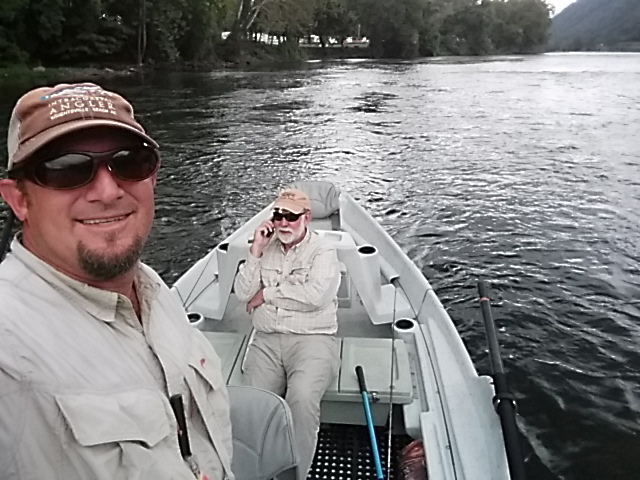 Marie, Steve, and I met bright and early near the river and had coffee, then we were off to the water to fish and quickly suited up and were on the water mid morning. It was chilly, low to mid 20sF and heavy frost. Several cold nights have plummeted water temps into the mid 40s, warming to near 50F by afternoon….and the fish have been quite active and we’ve done very well. Had a great day and caught fish on a variety of patterns. The water has returned to pre-flooding lows where we were fishing, a real surprise to me given the such incredibly high water conditions of a week and a half ago. Pretty amazing it could get that way so quickly. But it is what it is and the fish are eating. Just pulled a page from my tailwater tactics and flies playbook and we fished light , long, and small. Worked like a charm. Challenging fish became willing fish and before long we’d tallied more than 40 fish and several that were citation sized. 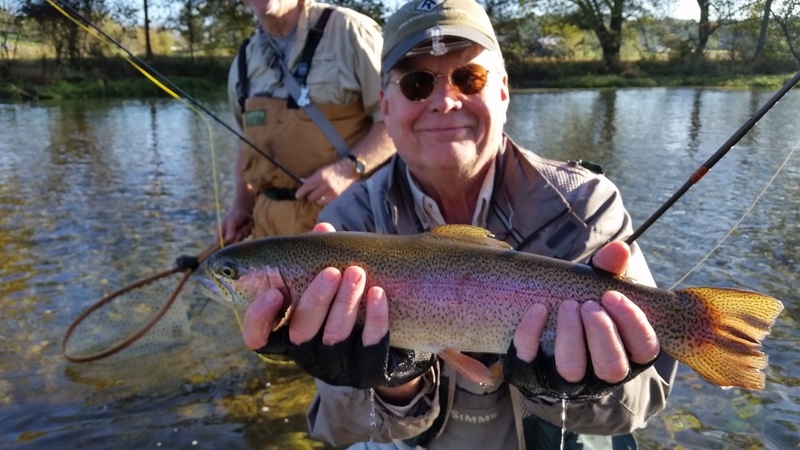 Some incredibly fine rainbows, and a couple of wild browns, one that was 18″. 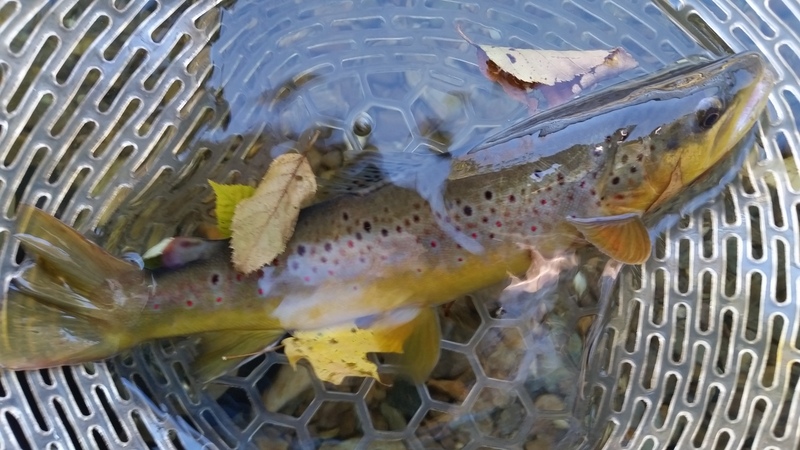 Had a shot at a brown that was in the 26 to 28″ class but could not entice him to eat. I’ll be back for him though……and I’ll get him to eat. A great day, I’d say Steve and Marie got a great start at this sport tallying about 60 fish in two days of fishing after never having fly fished before. Pretty good I’d say…..had a great time and they were great to spend it with. Great two days with Steve and Marie and while chilly we couldn’t have asked for finer weather. Just like Montana and Wyoming weather, sans the leaves. But they too will be done soon, and most of the higher elevation waters are seeing big relief in terms of fewer and fewer leaves as the month wears on. Leaf peak is right now on areas to our immediate west, southwest, and south….and it too will be over soon. Busy week ahead…..more reports will be forthcoming. Enjoy your week. Chilly with Lots of Leaves…. Sun. Oct 18, 2015….A chilly weekend for sure, we had a chilly day yesterday as a Canadian airmass arrived late Friday. Night time lows in the 20sF made for some crisp weather. Had another pretty good day Saturday as well, a good end to a great week. On Saturday I guided a trip w/ Dr Steve Klein and his wife Marie, Greensboro, NC, NC Mtns, chilly start as I mentioned, met up with Steve and Marie early and we were off on our way. It was cold and a very heavy frost, first of the year, lie on the ground and in many cases heavy enough on grassy areas to look like a dusting of snow. High 20sF were the lows, it was chilly to start but warmed up nicely by late morning and turned into a nice day. Some gusty winds the first part of the day made for difficult fishing as a major leaf drop, hopefully the last one for this area, occurred. So many leaves in the water that for long periods it was almost impossible to fish without snagging them. And it turns the fish off for brief periods as well. It subsided though and we were able to get into some fish, Steve and Marie were out for their first time fly fishing and it was a success. 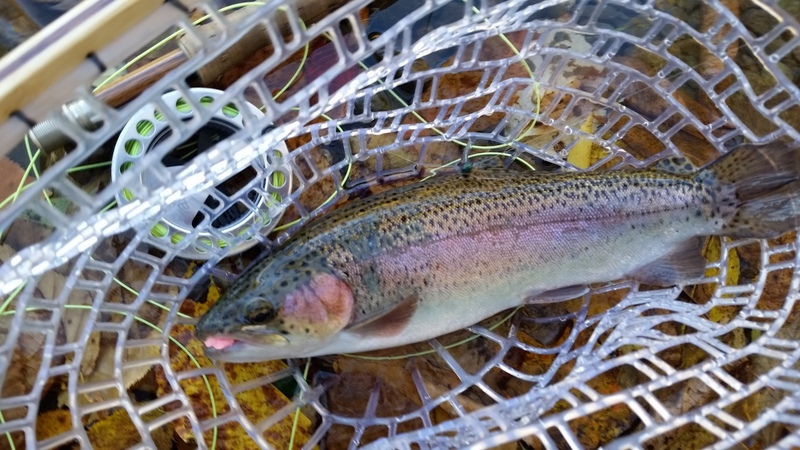 We landed a good many rainbows and had an enjoyable time, and finished up early afternoon. I went to another area afterward and found a few myself, trying out some new patterns as I have had /been running so many trips Ive had no time like that in a very long time. That is how I develop patterns I fish with….so its valuable time. The next issue of Southern Culture on the Fly is now out/available. A great local publication with a good bit of info and articles on our area, which is kind of nice for a change. Click here or logo below to view the latest issue…. Sat. 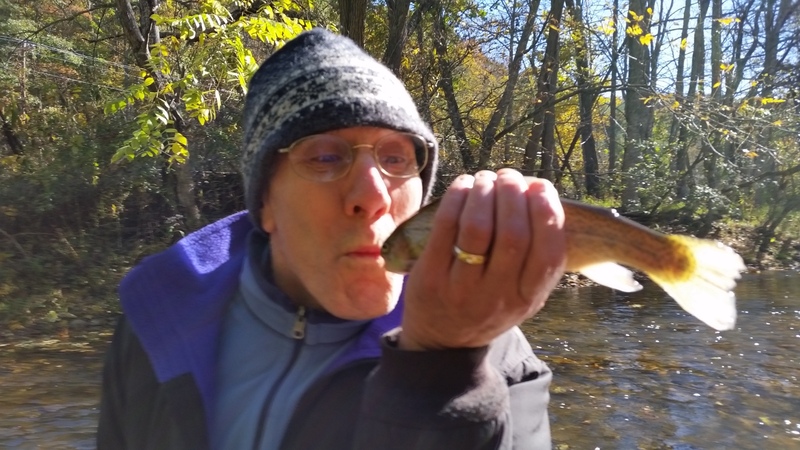 Oct 17, 2015…..Great weather great fishing……I see a pattern here. Guided Trip, Johan & Marcus Aspegren, Oak Ridge, NC, NC Mtns, on Friday and met up early with Marcus and Johan, we fished two stretches of water and did very well, fishing early was great, it was chilly, temps in the low 40s and you could see your breath so it was quite crisp. The gray, low sky was perfect and the fish definitely have the feedbags on. We did really well the first half of the day, and especially while it was cloudy and drizzly, when a cold front was making its way into the mtns. We netted about 40 or so browns and rainbows by lunchtime. The sun eventually came out, warming things up ten to fifteen degrees or so…..we caught more fish but I’d say probably 10 or so, ending with about a 50 fish outing. Certainly made believers out of the guys in the gift of cold and cloudy conditions……the fish were much easier to catch. We fished til late afternoon and called it a day. You could really feel the chill of this cold front coming in, it was chilly and blustery with stiff NW winds up to 25mph. Highs Sat are supposed to be upper 40sF and lows the next several nights in the 20sF. That will really turn the fish on. Will be guiding Steve and Marie Klein today and should be a good day. Chilly yes, but it’s fall it’s the mountains and that’s normal. Fri. October 16, 2015….Hard to believe the month is half over, its blown by. As busy as I have been all year and its been great….fishing has been superb. A lot of up at 4am, out at daybreak, in at dark, repack, do it again type of thing. Repeat. Repeat. Fishing has been outstanding and we’ve had some great days the past week and a half……here’s a quick update…. 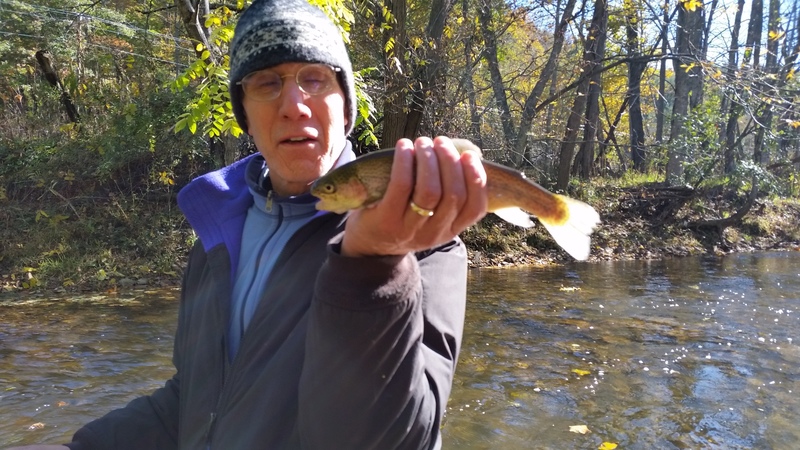 10-10-2015 FISHING REPORT – Guided Trip, Dave & Marianne Link, Raleigh, NC, NC Mtns, met Dave and Marianne early in the NC Mtns and we were off to where we were going to fish for the day. Water levels still up, but much improved over the past several weeks. 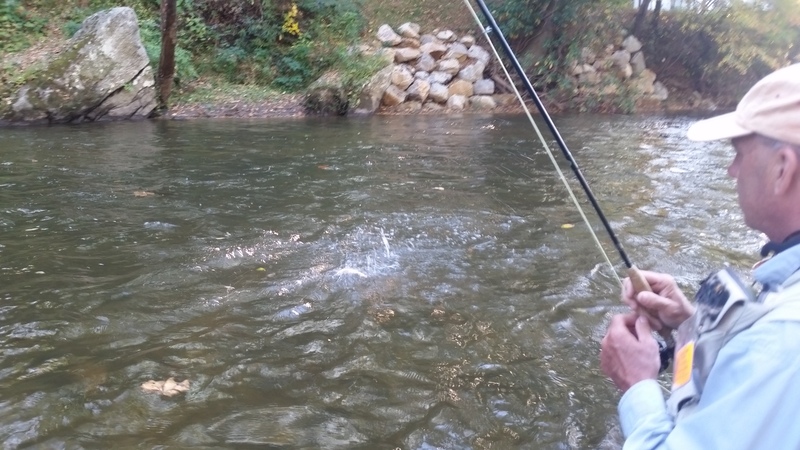 Fall is here, and the fish are definitely feeding up with winter coming…..and it was on from the first cast. 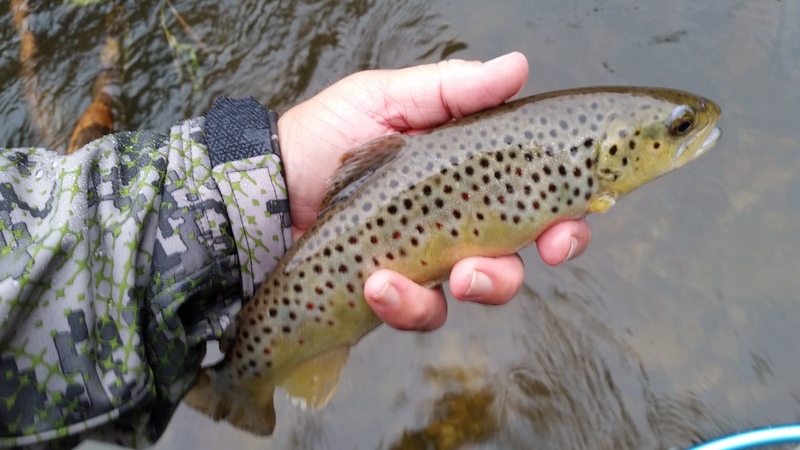 The water was about 6 inches higher than normal, which made for zero dry fly fishing but the nymph and streamer fishing, as it will usually be in high water, was lights out…..as good as it gets. 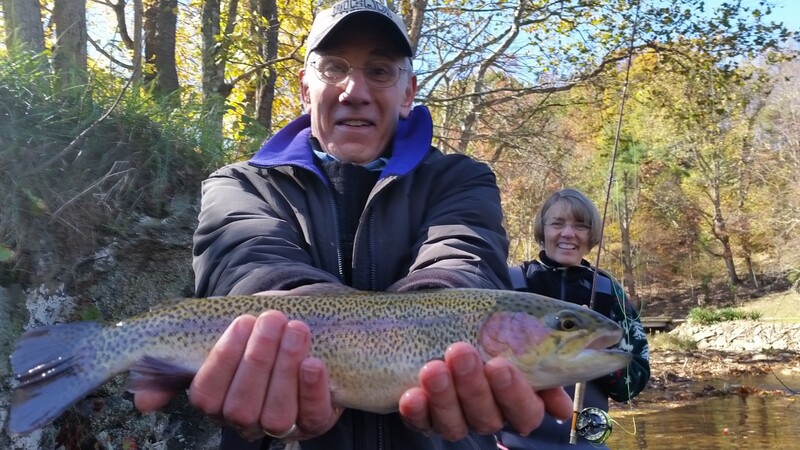 Dave is an experienced angler and we’ve done many trips in the past, but this was Marianne’s first fly fishing trip. 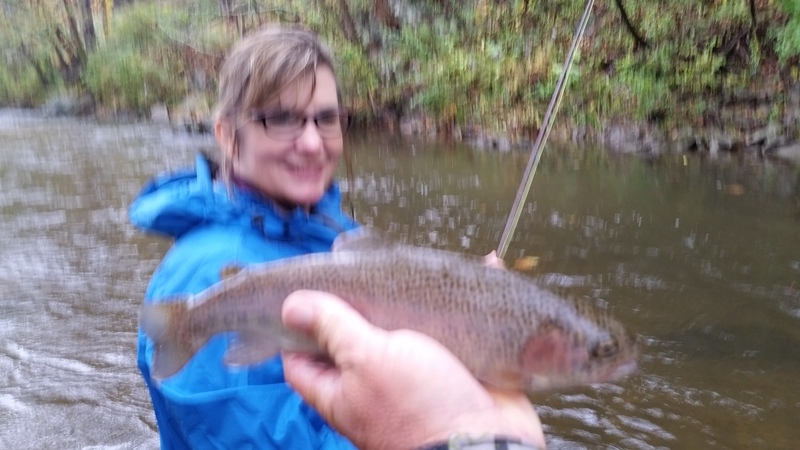 She landed about 15 fish, a mix of rainbows and browns……it was great. All of our fish came on double streamer rigs and double nymph rigs rigged right angle style. Great day though we fished in all day rain….. the kind of day I’d choose if I am fishing…..which helped us have an over 50 fish day , way beyond it in fact, lost count…… realistically more in the 70 to 75 range. In any case it was great. We finished up about an hour before dark and called it a day. Sorry for the blur below……all day rain will do that to the outer surface of a camera lens…. Day One…we got up really early as fishing has been lights out early on where I took the guys, we had a fair morning landing about 15 fish before the water came up on us at 9am. We were in the river at daybreak, and it was alive with activity. Several nice fish, including a SOHO 20/20, which is a 20″ plus fish on a size 2o or smaller fly, it was a large rainbow landed by Kim Arthurs. 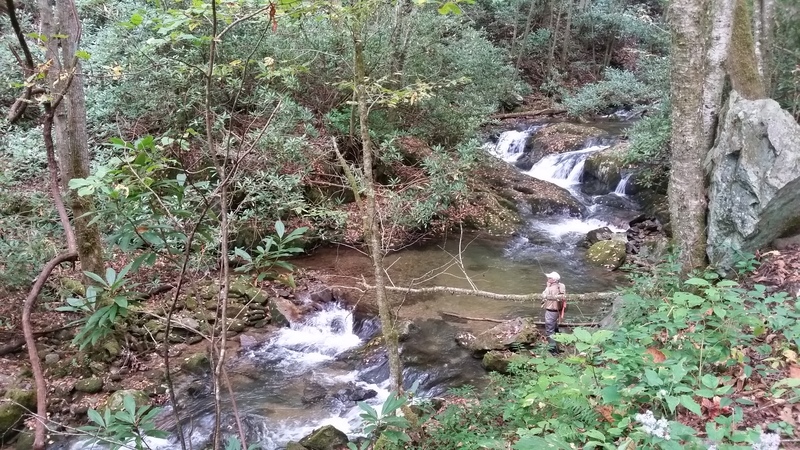 Our plan was to fish til water came up, then ride down stream and hit one more spot, then heading off to an NC water to fish the rest of the day. We caught our morning fish on midges. We were done on the Soho by 11am and we ran back by the house, picked up lunch, and were on our way. 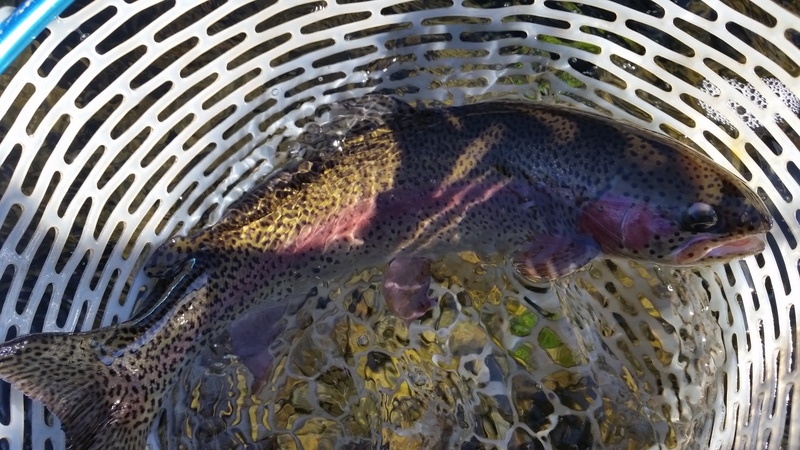 We fished the afternoon and landed about 35 fish, all rainbows. We called it a day about 6pm and then headed back to the house for a nice dinner. Day Two…..We had very chilly temps, 30sF and you could see your breath. It was cold and fishing was hot, we were in the water at daybreak and were into fish right away. We used a variety of nymphs and midges and a few assorted dries and caught fish on all of them. Not as many risers early, not as many as yesterday, but still fish were very active. All sorts of rigs worked, from two nymph rigs to dry /droppers to dries. It was incredible, Im guessing the guys landed somewhere north of 80 fish before the water came up at around 1pm. We then had lunch , moved downriver, and fished a couple more spots, catching a few on nymphs before the water came up on us and we called it a day about 330pm. It was a great two days, great fishing for sure, and the guys were fantastic. 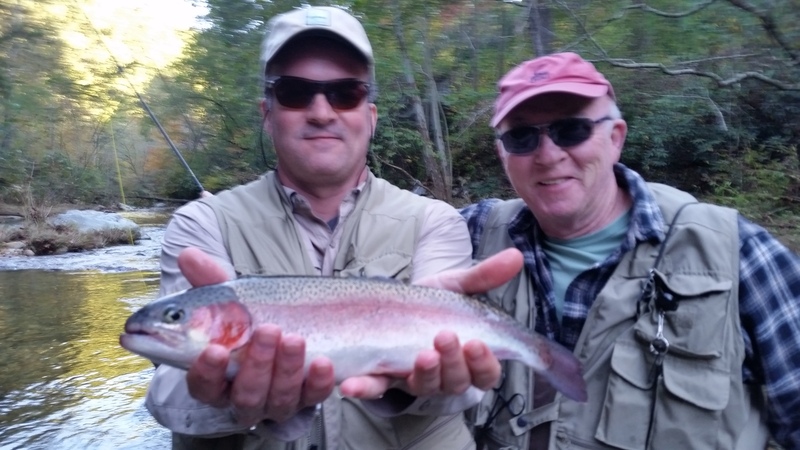 10-15-2015 FISHING REPORT – Guided Trip, John Keller, Stokesdale, NC, NC Mtns, met John and his Dad bright and early and we were off. 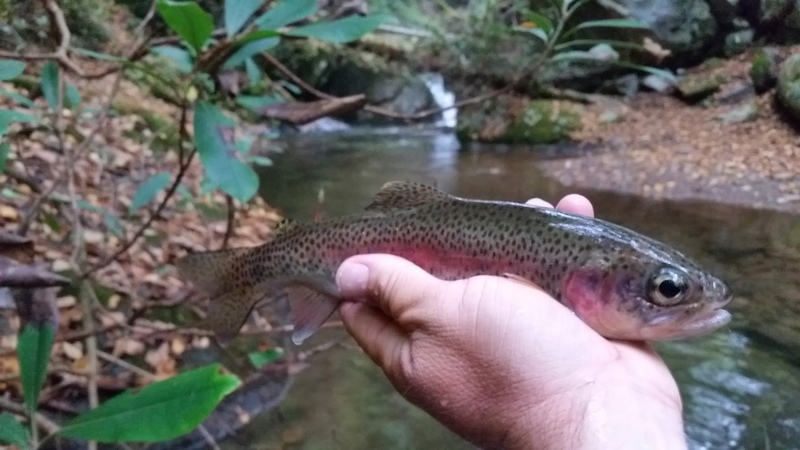 We fished on the NC side of the mtns and had some great fishing, it was very chilly early, definitely fall like for sure. High 30s to start and warmed to around 65F -68F in the afternoon. Just like weather out west. It was great. Fishing was great too. We caught fish just about everyway you can…..nymphs, streamers, double nymph rigs…..it was all good. I didn’t keep count but if we didn’t top 100 fish today I’d be really surprised. 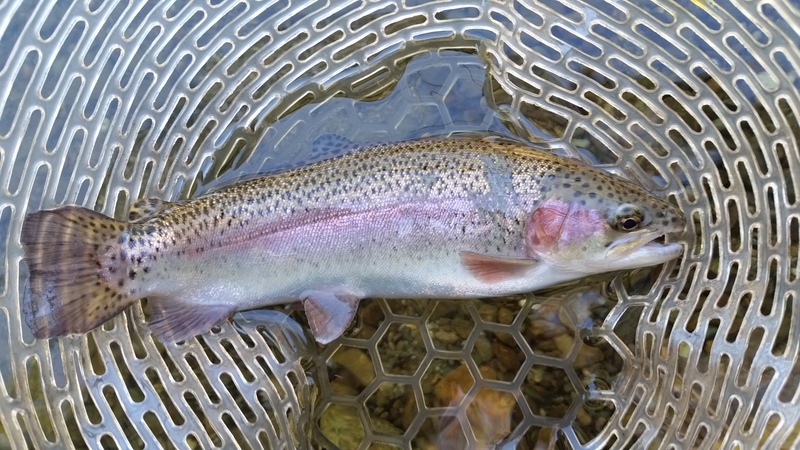 Caught a good mix of rainbows and browns, some very nice rainbows in particular. We fished two different stretches of water and had great fishing on both. Water flows were excellent, about as good as it gets or as close to perfect as it can be for October. All that bad weather in the past weeks was a blessing in disguise. Have a great weekend……headed out the door as soon as the last keystroke of this report is typed. Have a trip today with Johan and Marcus Aspergen and we are fishing NC mtns today, tomorrow I end the week with a trip with Steve and Marie Klein. Expecting a great end to the week, and looks like some chilly weather coming…..our first frost. BRRRRRR……..I couldn’t be happier. Sun. 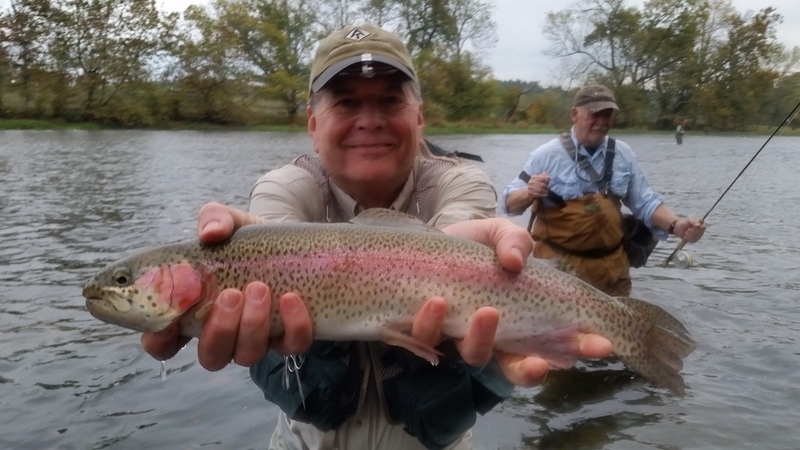 Oct 11, 2015…..What started early last week as torrential rain and incredible flooding ended with several great days, including three days that included some of the best small stream fishing of all year, one day of some of the best Delayed harvest stream fishing of the whole year, and one of the top 5 days on the Soho of the entire year. So yeah, its been a great recovery from all the bad weather. Had an interesting week with the weather issues, one of which was a large tree falling on our house, one thing we are still dealing with as far as extensive repairs. But when I see what is going on in SC, we have it way better than those folks. Our prayers are with them. 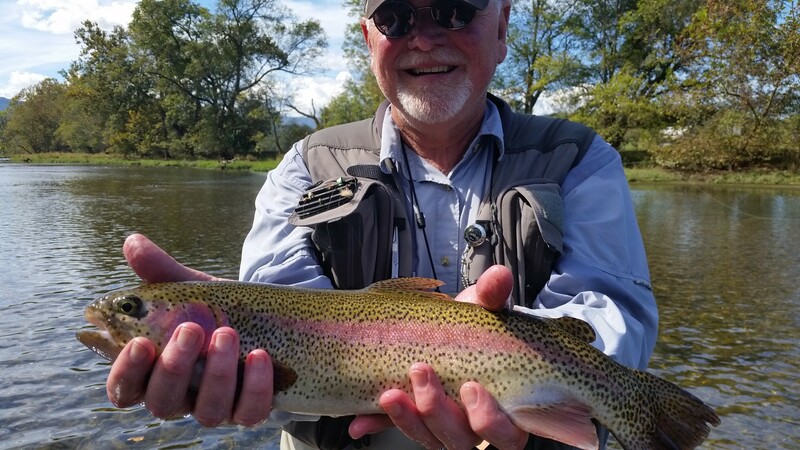 Here’s a recap of our most recent fishing this week…..
On 10-8-2015, Thursday, I did a guided trip with Larry Pritchett and Tom Goldston, High Point, NC, Tom Currin, Atlanta, GA, on the TN South Holston, we fished the South Holston and one NC water and caught about 80 or so on the South Holston, then about a dozen on the NC water that we fished. The SoHo was fantastic, we fished a variety of stuff wet and dry and did very well catching fish on a variety of flies. The theme was definitely SMALL….lots of blue winged olives and midges on the water, creating the need for some 18-22 flies for sure….saw a few sulphurs but not as many with the midday release coming. To do what we did in a little over a half day of fishing and several ( I think 5 of them) 20″ plus rainbows to boot, the best one being a 22 incher, I’d say it was a great day. We fished til the water came up, then we decided to take a quick lunch break, and then we headed downriver. By the time we finished lunch it was 2pm, so we decided to head to the NC side for some fishing since the water was an hour away from coming up anyway where we were. We did fair where we fished, not as well as I would have expected, but the water was still up and we still landed about a dozen fish, which is a good afternoon by some standards. We’ll take it! In any case it was a great day by any standard. Weather was phenomenal, the fellowship was the same, and the catching…..well it was that too. On Friday I did a hike in backcountry group Trip with Brad Ball, Stephen Starnes, and Steve Lucy, we did a hike in water in the upper Nolichucky (TN) drainage and also a Madison Co NC water….. Its incredible the variation in NC, TN, and VA during the past weeks’ flooding. TN was mostly spared, VA had some high water, incredibly so in some parts, surprisingly little in others, and NC had a lot of variability as well. Some NC waters are in great shape, some are still high, some are fishing well, some are totally blown out. Not the water we fished on Friday though…..it was ideal. We landed between 50 and 60 wild fish on dries……water levels there were perfect, much improved area wide….dry fly fishing was fantastic, in fact a nymph was never tied on…..stimulators, caddis, parachute hare’s ear….all produced numbers of fish. All rainbows, all WILD, truly special. A great hike as well, and some beautiful scenery. Its really amazing though how fast high elevation waters clear out after a hard rain and lots of rain. Water levels were great, and about as absolutely perfect for high terrain small water as you could ever have. That is probably why we did so well. Great water, great fishing though, I imagine that is a theme I’ll be talking a lot of in the coming weeks. Its Fall and we have water….what a blessing that is. 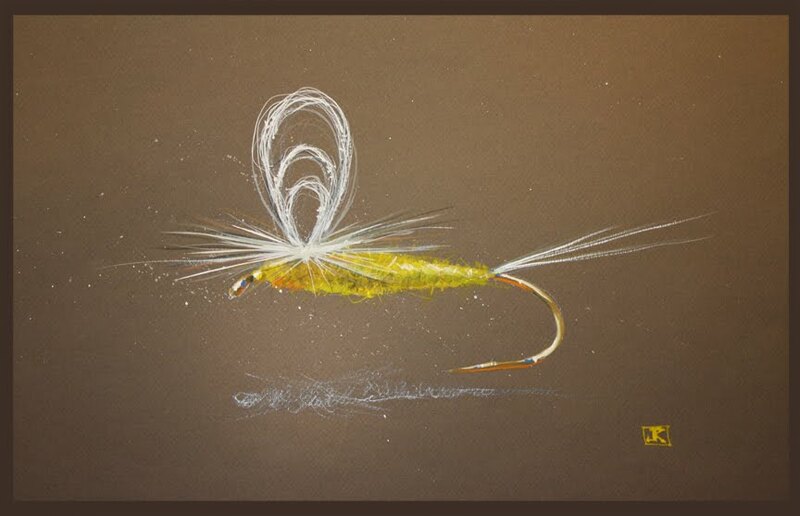 We have available every month a Printable and Free Fly Hatch Chart …. 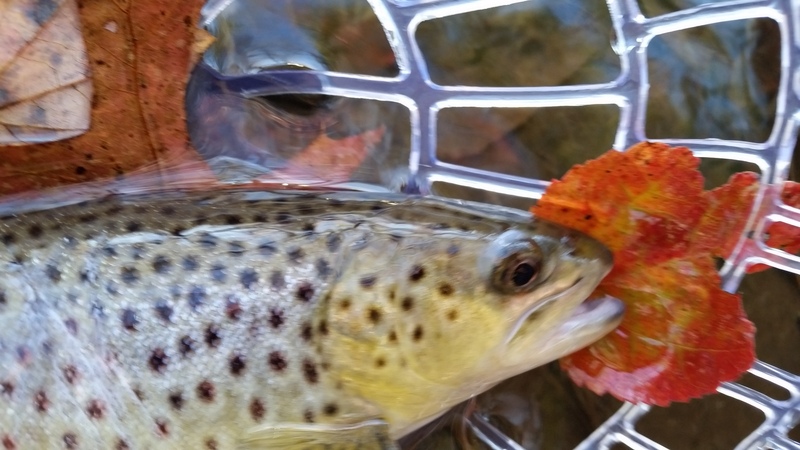 Click here to view or download an October hatch chart. 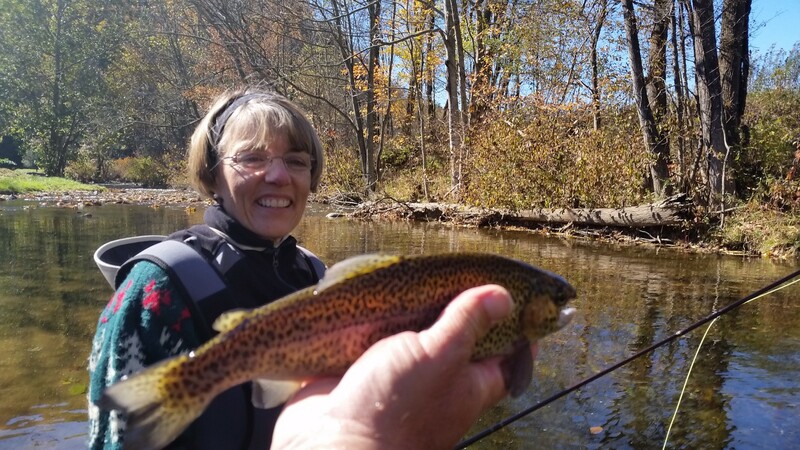 On 10-10-2015 I guided Dave & Marianne Link, Raleigh, NC, NC Mtns, met Dave and Marianne early in the NC Mtns and we were off to where we were going to fish for the day. Water levels still up, but much improved over the past several weeks. 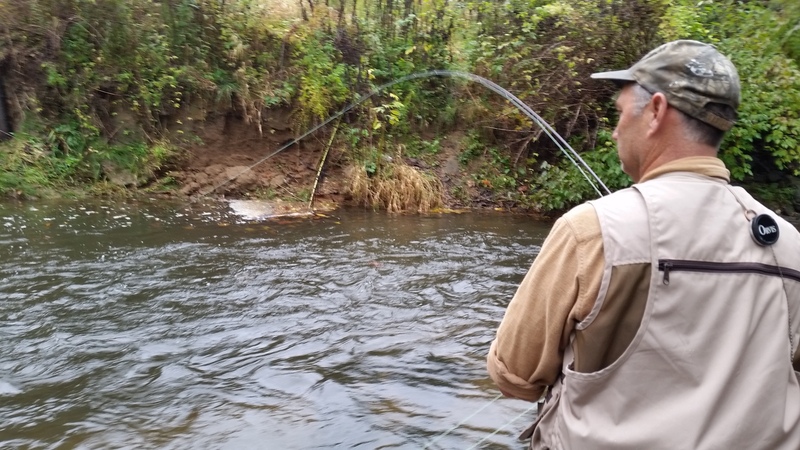 Fall is here, and the fish are definitely feeding up with winter coming…..and it was on from the first cast. 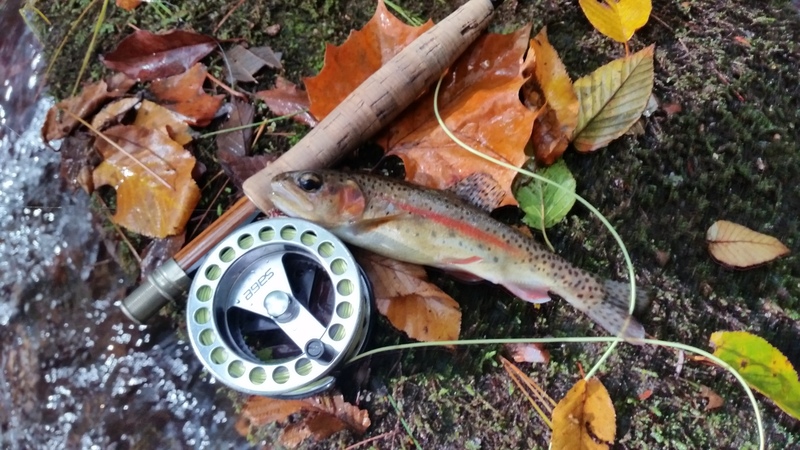 The water was about 6 inches higher than normal, which made for zero dry fly fishing but the nymph and streamer fishing, as it will usually be in high water, was lights out…..as good as it gets. 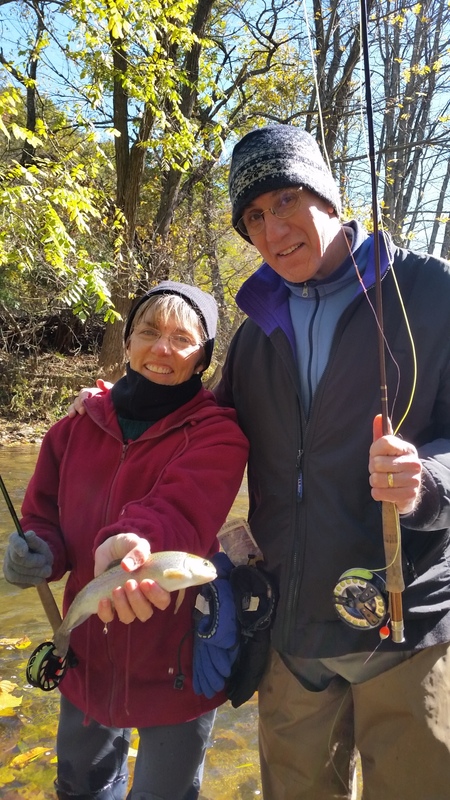 Dave is an experienced angler and we’ve done many trips in the past, but this was Marianne’s first fly fishing trip. 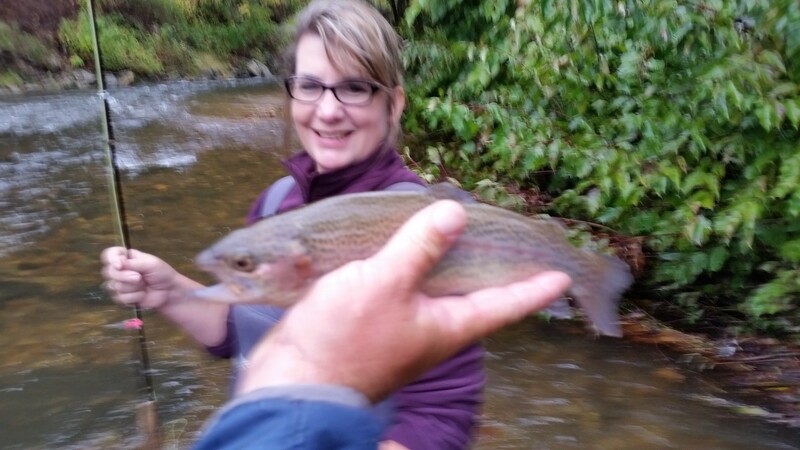 She landed about 15 fish, a mix of rainbows and browns……it was great. All of our fish came on double streamer rigs and double nymph rigs rigged right angle style. Great day though we fished in all day rain….. the kind of day I’d choose if I am fishing…..which helped us have an over 50 fish day , way beyond it in fact, lost count…… realistically more in the 70 to 75 range. In any case it was great. We finished up about an hour before dark and called it a day. 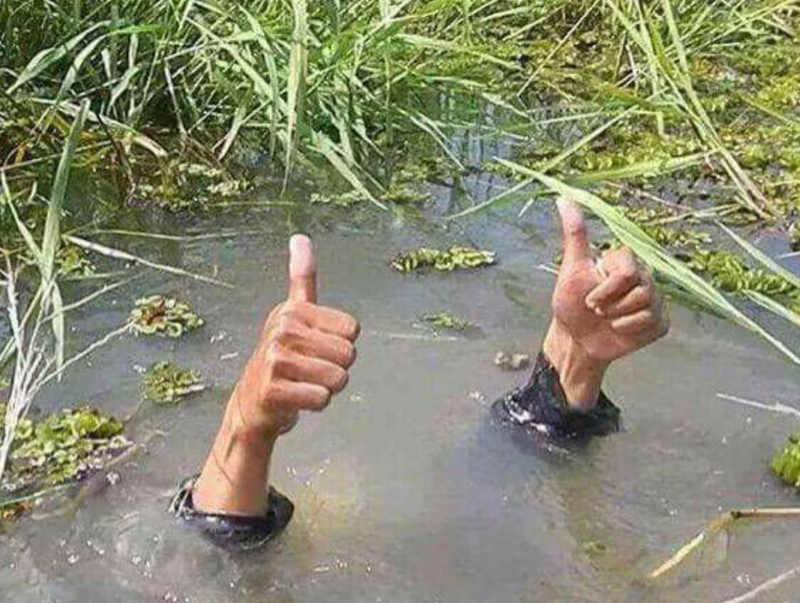 Great end to the week though, and starting the process of making up a lot of cancelled /rescheduled trips with clients…..have had more of that the last two months than I can remember in decades. One reason my availability of days is limited ……I’m urging clients I have a good many Nov and Dec dates still open but they won’t be for long. I’ll probably blow through November’s availability in the coming days so anyone wanting to do a trip before Christmas its not too early to nail a date down. 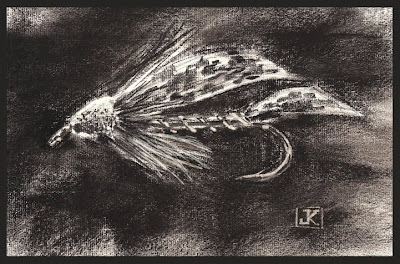 Fishing should be great, and of course, we guide/fish all winter long so we don’t have ‘an off season’ , a ‘slow down’, a ‘slow time’, or a time when we are ‘less busy’. 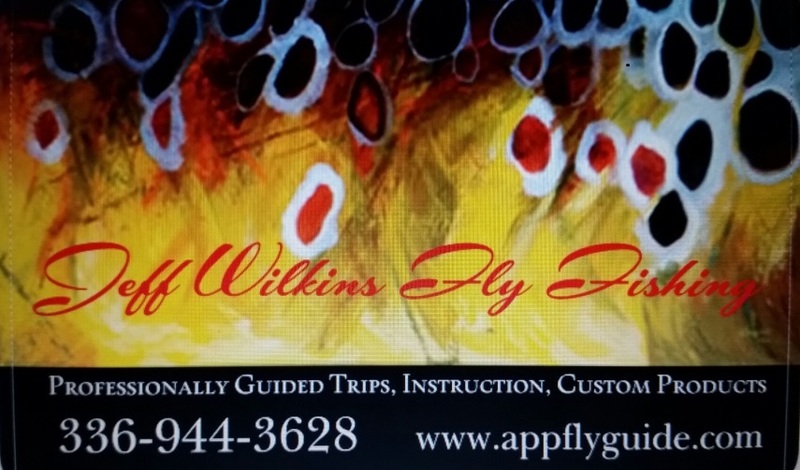 Have trips all week, starting with a three day SoHo trip Mon thru Wednesday with one client from Fayetteville, one from SC, and three from Delaware. Mid week I have a couple small stream trips , and another small stream trip on Saturday. Busy week, its the busy season, and look forward to some great days. 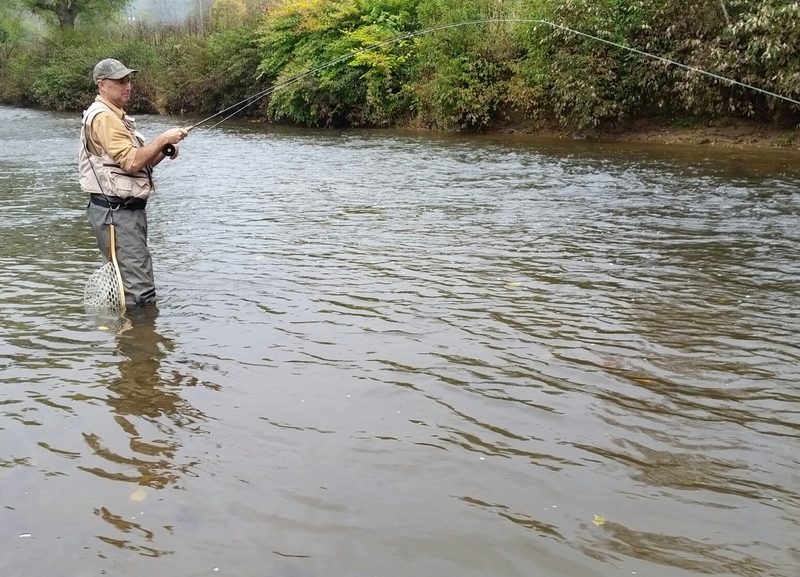 NC Wildlife Commission has put out a revised DH stocking schedule that covers stocking schedule for waters they were unable to stock this week due to high water and flood conditions. They will often do this when conditions make it likely that large numbers of stocked fish would be lost because of high water. Most places fared quite well, and while they stocked some on 10/1 before the high water it appears that the fish on most waters that we stocked pre flooding did quite well. Click here to view a revised schedule. 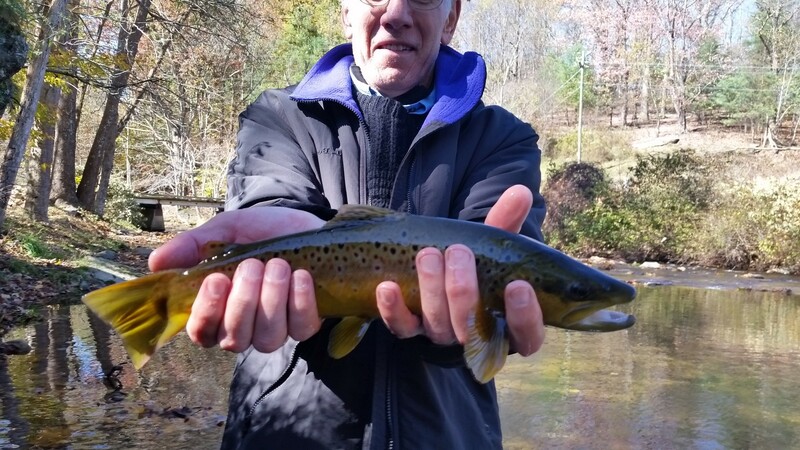 The NC Wildlife has created another public fishing area on the South Fork New in Watauga Co wherein anglers can access an area that has opportunities for wild brown trout, smallmouth bass, rock bass, redeyes…..click here . Also, the NC Wildlife stocked a new water at Hanging Rock State Park, the 12 acre lake there with 1200 catchable sized rainbows. For more info on this new trout water click here .